Genetic therapy often involves the use of replication-incompetent retroviral vectors that are designed to carry information into the genome of the somatic cells of the body. The strategies most frequently utilized have involved the ex vivo modification of hematopoietic cells, as shown in Table 1 [1–9]. These strategies have involved the harvesting of peripheral blood and marrow early progenitor cells, following which these cells are incubated ex vivo with the transducing vector and then reinfused into the patients after delivery of some form of preparative therapy that is designed to reduce the number of competing cells. 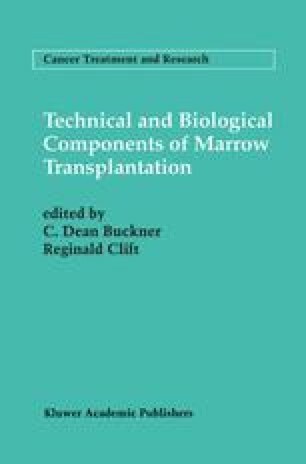 In those cases in which correction of the genetic defect in the hematopoietic cells has provided a selective growth advantage to the hematopoietic cells, there has been no necessity for the use of preparative therapy to ensure the dominance of the genetically modified cells following transplantation. In addition, because the frequency of the genetic modification is often in the 2–10% range for retroviral vectors, and often the genetic modification confers no selective advantage on the modified cells, several investigators have initiated in vitro animal models and in vivo clinical trials in humans that are designed to test if chemotherapy resistance genes can be used to confer a selective growth advantage on the genetically modified cells to ensure that the modified cells will be retained after transduction and transplantation.